Mad Professor is a CryptoLogic Slot Game Release. The Monster wants to Live! 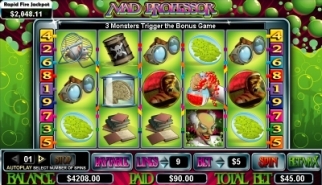 Will you be the one to shock the monster back to life in this fun, 5 reel, 9 pay-line slot game? Wagering is simple in Mad Professor, instead of credits, your bet, balance and wins are displayed in monetary format. You can wager 5, 10 or 25 cent coins or roll high with $1, $2 or $5 pay-line bets. Cover any pay-line with a $1 bet and a matching combination of 3 Books, Test Tubes and Poison symbols nets a win of $5 or 5 times your wager. Add in a Mad Professor Wild symbol and you automatically hit 20 times your wager while just a single Mad Professor Wild symbol on a covered pay-line wins twice your wager. The winning only gets better as a matching combination of 3 beakers, mouse wheels or electric fields nets a win of 10 or 15 times your wager when stopping on a covered pay-line. A Jar of Brains, Igor and Monster Scatter symbols round out the pays with only 2 required to double your bet. Get 3 Jar of Brains for 25 times your wager or 3 Igors for 50 times your wager. Of course the big wins come with matching 5 Mad Professors on a cover pay-line for a win of 4000 times your wager. 5 Igors pays a win of 2000 times your wager. 3 Monster Scatter symbols stopping on any reels wins 5 times your wager and triggers the Bring the Monster Alive bonus round. To give the Monster life, choose one of 4 tanks to pump liquid and shock the Monster. Pick correctly and you get to pick again to further increase your win. Pick 3 correctly and the Monster comes alive! A special feature available when playing Mad Professor is the Rapid Fire Jackpot. The jackpot starts at $500 and can be won randomly in any spin with or without a winning combination. Visit InterCasino or VIP Casino to play all the games that offer the Rapid Fire Jackpot.